Join the thousands of parents who chose AboutMyBaby.com to keep their family & friends in touch with their Online Baby Scrapbook. 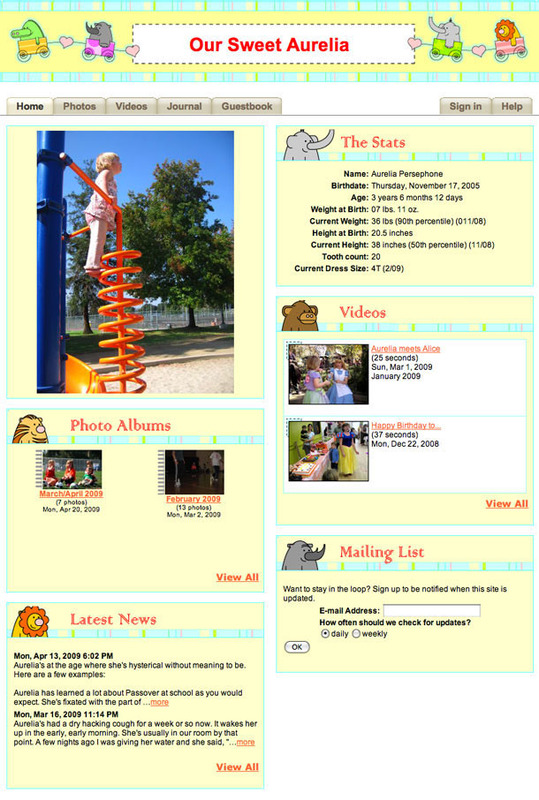 AboutMyBaby.com is a great way to start your Online Scrapbooking experience. Take a look at some of the easy to use features on an AboutMyBaby.com Online Baby Scrapbook in order to start Scrapbooking right away. With our great Keepsake product, you can store all your videos with us and get them sent to you on a portable hard drive at any time! Let your Family and Friends help you add to your Scrapbook by leaving personalized messages to your child. These messages will be preserved in time and when your child is all grown up they can look back and see what their grandparents, uncles and aunts wrote them. Public and Private Calendars allow you to keep track important dates like doctor´s check ups, birthday parties, special events and more. Also a great way to remind your Family and Friends of upcoming events. Everything you need to know about your baby! Development stages, Health and Nutrition, Ask the AMB Family and More!